For other uses, see Gyre (disambiguation). A gyre in oceanography is any large system of circulating ocean currents, particularly those involved with large wind movements. 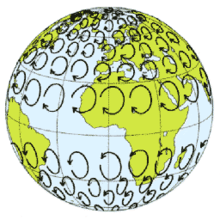 Gyres are caused by the Coriolis effect; planetary vorticity along with horizontal and vertical friction, determine the circulation patterns from the wind curl (torque). The term gyre can be used to refer to any type of vortex in the air or the sea, even one that is man-made, but it is most commonly used in oceanography to refer to the major ocean systems. Tropical gyres are less unified and tend to be mostly east-west with minor north-south extent. The center of a subtropical gyre is a high pressure zone. Circulation around the high pressure is clockwise in the northern hemisphere and counterclockwise in the southern hemisphere, due to the Coriolis effect. The high pressure in the center is due to the westerly winds on the northern side of the gyre and easterly trade winds on the southern side. These cause frictional surface currents towards the latitude at the center of the gyre. This build-up of water in the center creates flow towards the equator in the upper 1,000 to 2,000 m (3,300 to 6,600 ft) of the ocean, through rather complex dynamics. This flow is returned towards the pole in an intensified western boundary current. 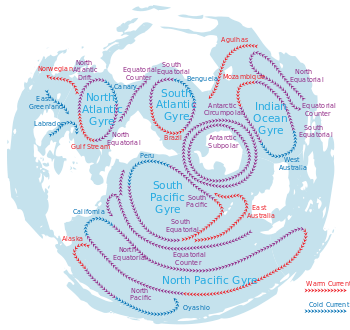 The boundary current of the North Atlantic Gyre is the Gulf Stream, of the North Pacific Gyre the Kuroshio Current, of the South Atlantic Gyre the Brazil Current, of the South Pacific Gyre the East Australian Current, and of the Indian Ocean Gyre the Agulhas Current. Recently stronger winds, especially the subtropical trade winds in the Pacific ocean have provided a mechanism for vertical heat distribution. The effect are changes in the ocean currents, increasing the subtropical overturning, which are also related to the El Niño and La Niña phenomenon. Depending on natural variability, during La Niña years around 30% more heat from the upper ocean layer is transported into the deeper ocean. Several studies in recent years, found a multidecadal increase in OHC of the deep and upper ocean regions and attribute the heat uptake to anthropogenic warming. Because the Coriolis effect is strongest near the poles, water flowing eastward at high latitudes turns sooner and is "short circuiting" the gyre. At the equator the Coriolis effect is nonexistent and the water flows westward until it encounters a blocking continent. Westward boundary currents are therefore faster and deeper than eastern boundary currents, and the geostrophic hill is offset to the west. ↑ Balmaseda, Trenberth & Källén (2013). [ Essay "Distinctive climate signals in reanalysis of global ocean heat content"] Check |url= value (help). Bibcode:2013GeoRL..40.1754B. doi:10.1002/grl.50382. ↑ Abraham; et al. (2013). "A review of global ocean temperature observations: Implications for ocean heat content estimates and climate change". Bibcode:2013RvGeo..51..450A. doi:10.1002/rog.20022. Look up Gyre in Wiktionary, the free dictionary.